Our apologies for the look of the cover. This was taken with a cellphone, since no image of the book could be found online. Ben Garcia is quickly becoming an adept student at blending steampunk and space opera, as evident in his debut novel, Sygillis of Metatron. In spite of the awkward sounding name, the opening book for his League of Elders series is a pretty good little offering. Okay, there’s a lot of back story involved in this novel, and this review would be close to three thousand words long if we went into it fully. Needless to say, it’s all very fascinating, only mildly detracts from the pace of the story and overall, links the beginning, middle and end of the book all together. I really wish this book hadn’t done that. 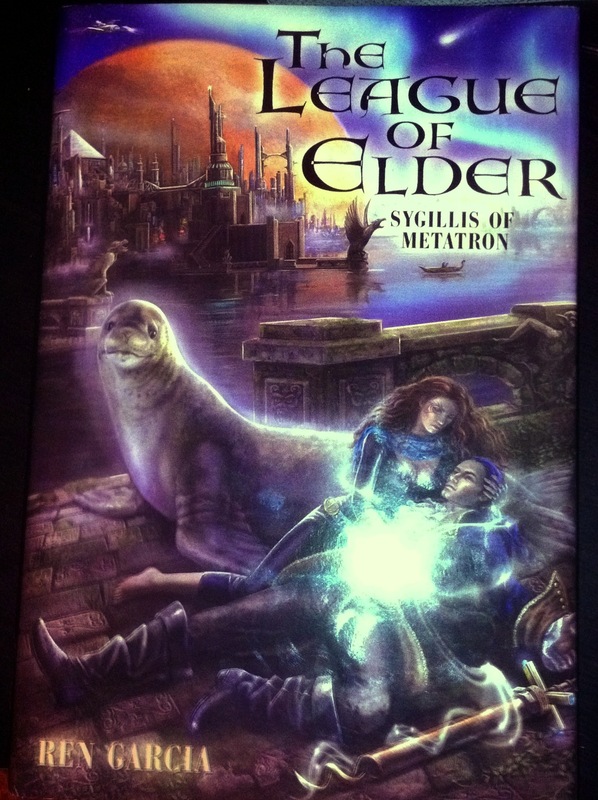 Sygillis of Metatron is one of those books that, if you can get past some of the new-writer flaws, has potential to be an amazingly good read. The story concept is fascinating, and the author’s writing style is pretty polished. The inherent love story and the sacrifices some of the characters make in the name of love is, without a doubt, very heartwarming. Plus, you find yourself rooting for Sygillis, no matter the cost may be to her soul. Now, some of the scene shifts are awkward, and you really do not have a sense of “time” in this book. Two paragraphs could go by before the reader realizes that the author has fast forwarded two months (or perhaps it was two weeks?) and it isn’t very clear when that happens. Sometimes the battle scenes are strange, since the reader gets the initial impression that Davage doesn’t want to really kill Marilith but eventually they both decide that the other must die. The most fleshed-out character, surprisingly, is Sygillis herself and not Davage, the star of the book. Once Sygillis comes into her own, she completely dominates the book, and the awkward sense that all is not right with the book in scenes she is not featured can slow down the reading process. Davage makes a few token “I’m the man of the book” moments but, by and large, this is more Sygillis’ story than Davage. I think that the author came to realize this towards the end, as Sygillis becomes the focus of some very intense rage and hostility from Princess Marilith. A fun read, and I think that Ben Garcia has something going here. This entry was posted on October 24, 2012, 6:58 am and is filed under Book Review. You can follow any responses to this entry through RSS 2.0. You can leave a response, or trackback from your own site.